The sheets printed with flock of different colours are used as wrapping paper of wrapping sheet, These sheets are also used as covers of different products. 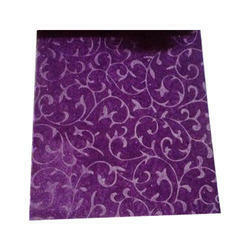 - Available Size: 4", 5"
Flocked Paper is made from handmade paper and have unusual textures. Some papers in this category are impressed, embossed, or flocked with various designs ranging from geometric to floral to reptilian. Use for : Paper Bags, Envelopes, Stationery, Bags / Shoppers / Sacks etc. Our organization is involved in offering an extensive array of Flocking Paper. Our product is made by using supreme quality material and advance technology. It is highly admired for their quality and designs. Known for its best quality, clients can avail this paper at industry leading prices from us. - Environment for Health Care Management. - Accounting and Finance for Health Care Management. - Marketing of heath Care Services.